Overlooking historic Fountain Square, our hotel boasts an outstanding location in the heart of Cincinnati's bustling central business district and downtown's vast array of fine restaurants, shops, museums, theaters, and celebrated sports stadiums.Whether you take advantage of our invigorating WestinWORKOUT Fitness Studio, the modern atmosphere of "Ingredients some assembly required," or 29,000 square feet of function space, this urban oasis abounds with amenities to keep you healthy and productive. 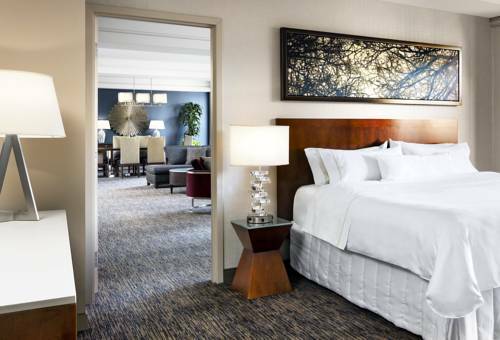 Our 456 guest rooms and suites feature the Westin Heavenly Bed, generous work stations, and 37" LCD TVs. Each room offers a contemporary experience with a soothing color palette and striking views of the city skyline or historic Fountain Square. Ingredients some assembly required: Discover a distinctly original dining concept in this restaurant inspired by Manhattan and Chicago caf s, where you'll find freshly-prepared grab-and-go items that are simultaneously healthful and enticing. Located in the atrium with free Wi-Fi. McCormick & Schmick's Seafood Restaurant: This charming restaurant provides a unique and relaxed atmosphere. Open for lunch weekdays and dinner nightly, the changing menu features an impressive array of fresh seafood, while every cocktail is crafted with fresh juices-no blender required.